The Korean peninsula has long been divided into the two countries: Democratic People’s Republic of Korea (North Korea) and Republic of Korea (South Korea). Unfortunately… it was NOT at all a peaceful separation given the infamous 250km-long and 4km-wide buffer zone of the Korean Demilitarized Zone (DMZ) that separates the two since 1953. (DMZ Tour). Today, it is referred to as the most heavily guarded border in the world given the battle-ready armies, fences, landmines, and fences on both sides. 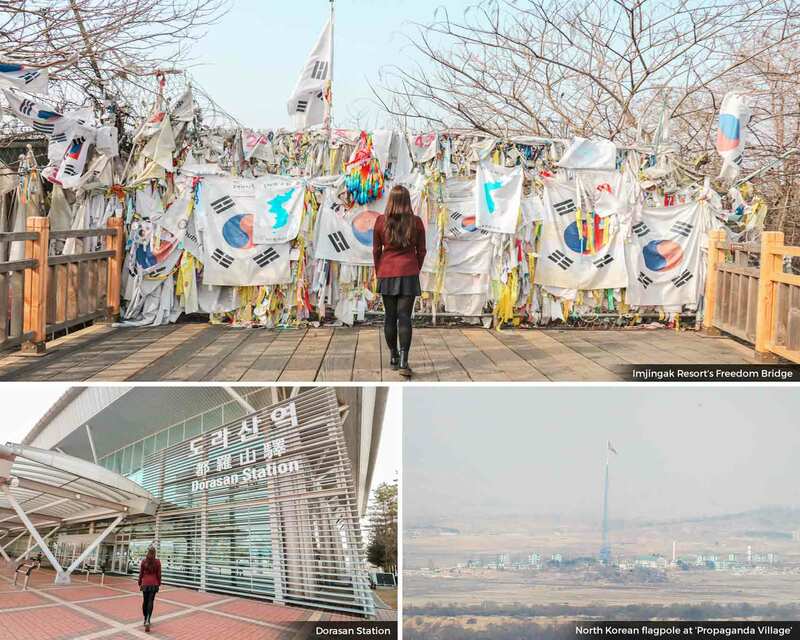 That being said, it’s undeniable how it is one of the scariest places in the world — and yet… it continues to be a popular major tourist attraction in South Korea that attracts a lot of curious minds and history buffs who are seeking to witness this surreal land for themselves (yes, people like me). ••• The DMZ was established by the provisions of the Korean Armistice Agreement (a “cessation” on the hostilities of the Korean War — so it’s not an agreement to end the war but a part of an attempt to negotiate peace). Under this armistice that was created in 1953 between China, North Korea and United Nations, it made DMZ a buffer zone between North Korea and the South Korea, thereby roughly dividing the Koran Peninsula in half. ••• For years now, there have been unfortunate incidents that have happened in and around DMZ (with the most notorious clashes happening in or near Panmunjom Joint Security Area or JSA, e.g. Panmunjom Axe Murder Incident, etc.). These events have caused military and civilian casualties on both sides and have almost sparked the resumption of the Korean War (thankfully, it didn’t). This heinous history combined with ongoing bad relations between North and South Korea had always given off a tense atmosphere for travelers who visit the demilitarized zone. In fact, though the DMZ tour is generally considered safe, things can happen out of the blue especially in JSA — this is why visitors are typically asked to sign a waiver whenever they enter JSA. ••• I can go on a long discussion about what brought on the Korean War, but I’ve decided NOT to discuss it here because aside from the fact that I’m not ‘qualified’ to talk about it, I also believe that a part of the allure of this DMZ tour is when the South Korean guides retell the history to you since you’ll also be hearing their own sentiments regarding how the Korean War went out of control. (But if you already want to read up on it beforehand, you can do so by looking it up online). Now, you might have heard of the recent news this 2018 on how North and South Korea have agreed to end the long-running Korean War in order to purse a more peaceful relationship with one another. This is great news not only for the Koreans but for the world too! That being said, it’s possible that DMZ will thankfully transition into a more amicable place soon — but for now, it seems that the standard DMZ tours are still being held (except for JSA). To know more info about this, please continue reading through this article. Come and check out my list of the ‘Best Hotels in Seoul‘ which features the top recommended choices for cheap to luxurious accommodation choices. What does this DMZ day tour entail and how much is it? The only things that are NOT included are personal expenses, insurance, and tips. Where is the meeting place for this DMZ tour? How long will it last? The meeting place for all of the 3 tours above is the same and it’s at: 10F, President Hotel, 16 Bishop Road, Seoul (which can be easily reached if you ride the subway and get out of Exit #8 at Euljiro 1-ga Station). Meanwhile, the vehicle will be a bus or big van depending on the number of people booked for that day’s tour. When is the best time to visit Seoul, and then do this DMZ tour? The DMZ tours run all year round, and as for the best time to visit, it will depend on your preference. UPDATE: Due to recent changes in the relationship between North and South Korea, the dates of the tours are rather sporadic. To check available dates, just check by the online booking site. Spring: (March to May) The city becomes a hit what with all the flora that start to bloom and bud. And of course, much like Japan, the city has cherry blossoms which tourists often seek. Given this demand, there tends to be a slight increase in costs, but the weather and season is quite desirable. Summer: (June to August) This is arguably the peak season in the city so things get busier and costlier. It doesn’t help either that this is the vacation month of schools and Korean companies so everyone is out and about. That’s why if I were you, you should avoid these months — also because the weather can get quite humid with occassional downpours. ★ Autumn: (September to November) This is the best time to visit Seoul because weather is pleasant, prices are more affordable, and crowds are thinner. However, do take note to avoid Chuseok or Korea’s autumn harvest festival. Winter: (December to February) As the temperatures drop, prices and airfare also drop. Take note though that it can get very chilly; but, supposing you’re not that sensitive to the cold, this can be a fun time given all the amazing ski resorts and festive atmosphere. What are other things that I can do while I’m in Seoul? Where to best stay (for accommodations) in Seoul? To search for the best hotel accommodation in Seoul at the best prices, I suggest checking out Agoda and Booking.com. But if you’re rather interested in renting comfortable houses or apartments, check AirBnB. As for ‘where’, these are the top 5 districts in the city: Myeongdong (best for shopping), Hongdae (best for a hip youthful scene), Insa-dong or Jongno (best for culture), Gangnam (best for luxury shopping), and Itaewon (best for nightlife). If you want particular hotel names per district, I prescribe that you read my ‘Best Hotels in Seoul‘ article. Should I get a visa to visit South Korea? If you’re NOT a citizen of any of South Korea’s exempted countries, you are then required to avail a visa beforehand. If you’re from the Philippines, you can read my guide on how to get a South Korea visa in Manila here. Is there someone here who speaks English? : Yeogi-e yeong-eoreul hasineun bun gyesimnikka? This JSA tour is the most sought-after tour by travelers to South Korea’s DMZ because it is the closest place to North Korean soil that anyone can step into without getting arrested or shot. Needless to say, this experience takes you to the ‘front lines’ and you can see up close the tension between the two countries. Located in the former village of Panmunjom on the western coast, JSA is comprised of several buildings separately owned and strictly guarded by the North and the South. 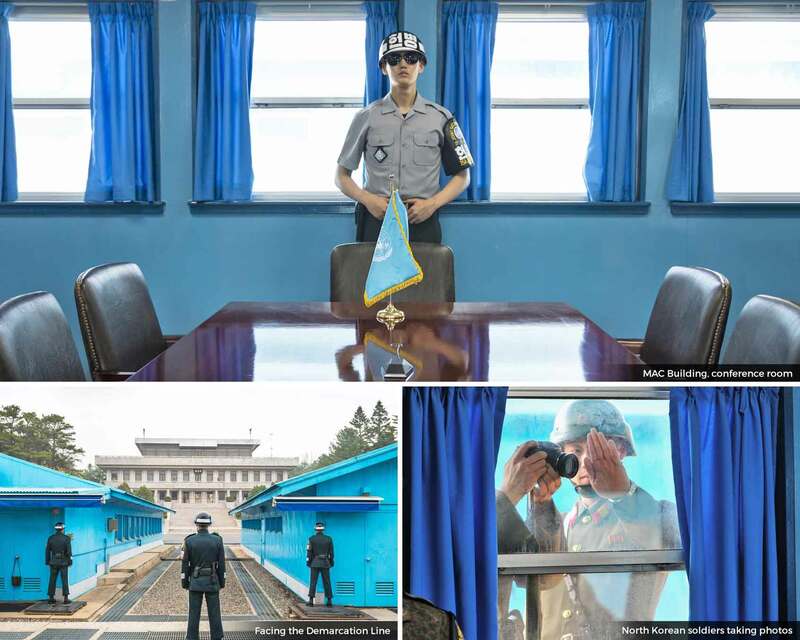 It also consists of the infamous blue conference rooms where negotiations often take place and where visitors are allowed to step in (and watch as both the stationed North and South Korean soldiers face one another, as if on a staring showdown). Now, a trip to JSA will only be possible through an organized tour that is approved by the government and there are strict rules being implemented (e.g. NO bringing in of cameras that have lenses of 90mm and higher, NO taking of pictures in certain areas, NO wandering without a guide, etc. etc.). …However, as of April 2018, trips to JSA have been shutdown not only due to military tension but also due to the imminent talks that are going to happen between the leaders of the North and the South. With that, it’s highly likely that this place will soon change into an experience that is less tense. Unification Bridge: You will pass by this bridge which was opened in 1998 in order to prepare for supplies exchange between North and South Korea. Checkpoints are usually found before and after to this point. TRIVIA: A large portion of the funds that were used to build this bridge was donated by Hyundai because its former CEO’s hometown was in North Korea. Freedom House: This is South Korea’s ‘propaganda palace’ that faces the Demarcation Line and the Panmom Hall (which is North Korea’s equivalent of the Freedom House). After visiting the Freedom House, visitors will usually be taken to the Peace Pagoda beside it that will offer great views over JSA and the surrounding countryside. TRIVIA: There is at least one North Korean soldier that will stand in Panmom Hall as he faces the South. There are strict rules NOT to make any kind of gesture towards that soldier or any North Korean soldiers for that matter, after all, you wouldn’t want to be the cause of a commotion on JSA against South Korea. Demarcation Line and MAC Building: You will find blue buildings that are positioned on top of the ‘Demarcation Line’ and smacked between Freedom House and Panmom Hall. Nearby, you will witness North and South Korean soldiers standing on alert, as they stare at each other all day. One of these blue houses is the MAC (Military Armistice Commission) building where negotiations take place and where you can technically ‘step into’ North Korean soil. TRIVIA: Inside MAC, take note that the neat lines of microphones on the central table marks the exact position of the Demarcation Line between the North and the South. This is also aligned to the low concrete bar mark outside. Anyhow, you’re free to walk around this small room and ogle at the North and South Korean soldiers that similarly stand guard against each other in an intimidating way. You might even feel like a ‘celebrity’ once inside because North Korean soldiers often observe you from outside the building. They will even film or take photos of you, as well as the South Korea soldiers inside JSA. Bridge of No Return: You will also pass by another bridge but this one crosses the Demarcation Line. Basically, this used to be a place where prisoner exchanges were done at the end of the Korean War. TRIVIA: Apparently, North Korea also holds their own DMZ tours to JSA; but it seems that their tours are timed to NOT overlap with the tours done by South Korea. RESERVE YOUR TOUR SPOT NOW. NOTE: Photography inside the Third Tunnel of Aggression is NOT allowed, so unfortunately, I can’t show you photos of it — you must see it for yourself! The Third Tunnel of Aggression is one of the 4 known tunnels that have been eerily dug out by North Korea as a way to possibly invade South Korea. As the name suggests, this was the 3rd tunnel that they have discovered and this particular one is said to have the capacity to transport 30,000 soldiers per hour which would have been beneficial to North Korea as a surprise attack on Seoul. Just the thought of this is quite frightening, and as if that wasn’t enough, we were even told by our guide that there’s a possibility of 10 or 20 other tunnels that haven’t been discovered yet! Take note, when this 3rd tunnel was found, North Korea defended itself by saying that it’s a part of a blasted coal mine; but of course, evidences on the tunnel’s walls suggest otherwise (e.g. the walls are made of granite and some parts of the walls were even seemingly painted black by North Korea to resemble coal). Since then, this Third Tunnel of Aggression has been blocked with 3 barricades and then turned into a well-guarded tourist site which involves a steep walk down. A word of advice, if you’re claustrophobic, this is a walk that you must skip on. …Anyhow, I just gotta say though that it’s a bit ironic how the tunnel was originally built for invasion to defeat South Korea; yet now, it serves as a major day trip attraction from Seoul — so if you think about it, North Korea inadvertently ‘helped’ boost South Korea, particulary in terms of tourism (though of course, the tunnels remain to be an unwelcome existence). North Korea Center of Unification Board: Shows over hundred of photos and documents showing the stark reality of North Korea. Mangbaedan Alter: The spot where Korean’s separated from their families in the North. Koreans typically visit this place on New Year’s Day and Chuseok (Korean Thanksgiving) to perform ancestral rites to their home and relatives in the North. Bridge of Freedom: Where South Koreans have crossed when they were released from North Korea. Nowadays, the bridge also serves as a memorial for all the families that were separated during the Korean War. You will even witness a lot of ribbons tied to the fences that each contain messages of hope, peace and love. Dora Observatory: Built on top of Mount Dora, visitors can look closer into North Korea with binoculars as they witness things like the North Korean propaganda ‘Peace Village’/’Propaganda Village’ (built to resemble a prosperous town but is actually a ghost town), Kaesong city (a nearby city with thousands of North Koreans living in it), and others. TRIVIA: You can also see from here the ‘flagpole war’ which is an example of North Korea and South Korea’s competitiveness with one another. It all started when South Korea built a 98.4m-tall flagpole in Daeseong-dong (a South Korean town in DMZ) in the 1980s. In response to this, North Korea built a taller one at 160m over at Kijŏng-dong or the Peace Village/Propaganda Village. Because of this, it used to be the tallest in the world for a decade, but today it is now the 4th tallest flagpole worldwide. Dorasan Station: This is the northernmost train stop on South Korea’s railway line that serves as yet another tourist attraction on DMZ — until the day that it would finally serve as a proper train station that connects North and South Korea when peace finally prevails. TRIVIA: You can find stamps here to commemorate your visit to Dorasan Station. Alternatively, you can purchase a train ticket to Pyongyang, but it’s basically just payment for the chance to stand on the platform as you wait for a train that will never come. UPDATE: Since I visited in April 2018, the JSA tour and JSA combined tours were no longer being offered due to the recent dealings between North and South Korea — nevertheless, the DMZ tour that I’ve done to the Third Tunnel of Aggression is still running and it still proved to be such an amazing yet surreal experience (not to mention that our tour guide was beyond amazing given how she provided a lot of interesting history and explanations). Either way, feel free to click the button below to check if there happens to be open dates for this combo tour in the next weeks. It might seem crazy at first to go on a DMZ tour, but I still urge you to go because it is one of those mystifying yet insightful experiences out there. Yet of course, all in all, what I just hope now is that this place will soon be taken down (much like the Berlin Wall) so that peace could once again prevail in the Korean peninsula. With regard to the kind of tour that you must do, naturally, doing the combined JSA and Third Tunnel of Aggression would be your best choice, so if there is ever an available tour date, I say go ahead and grab it! Otherwise, a tour to the Third Tunnel of Aggression would already be quite an experience for you. What do you think of of this DMZ tour? Would you like to go on any of these DMZ tours? Why or why not? Or have you been to this kind of tour before? How was it for you? Hello! I found you by chance but it was me who struck gold, South Korea and visiting DMZ was one of my bucket list but after reading through your blog I have started planning for next years autumn trip! Thank you! What an adventure you have there. Ill include this to my to my travel list. I'm torn about which tour to take. I find this very interesting as I've never been near a guarded border before. I've been watching Korean dramas on Netflix. What an amazing experience to visit. I'd love to go. My husband loves political history, so this would be his kind of trip! What a unique and interesting experience. 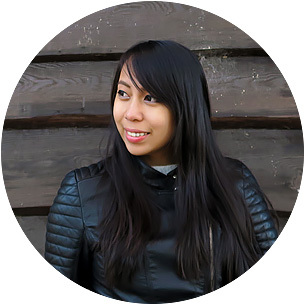 Hi Aileen if I have failed to book in advance, where can i buy DMZ tour? Usually, a day in advance is required :) You can still book via the links above. That visit to the DMZ and JSA sounds surreal with lots of tension. Just signing a waiver in itself filling with trepidation. Oh my goodness, what an adventure that must be! Sounds fascinating!